"This Diamond Ring" is a 1965 song written by Al Kooper, Bob Brass and Irwin Levine. It was first recorded by Sammy Ambrose on Musicor #1061, then by Gary Lewis & the Playboys on Liberty #55756. Lewis' version charted first, #101 on the January 2, 1965, Billboard "Bubbling Under" chart. Both versions charted on January 9, Lewis still at #101 and Ambrose at #117. Ambrose dropped off the charts at that point, but Lewis made #65 on the Billboard Hot 100 chart the next week (January 16) and his version continued to climb until it reached #1 on February 20, 1965. According to David Brackett, Lewis' vocals were heavily supported by Ron Hicklin's overdubs. The session drummer was Hal Blaine, Joe Osborn played bass and Leon Russell both played keyboards and arranged the music. The song was produced by Snuff Garrett. Lewis has denied claims that the Playboys did not play on the record, and says that not only was the band largely self-contained, but the Wrecking Crew session musicians only came to do overdubs or solos. Stylistically, the song's recording features the then common "basic 'combo' instrumentation...(electric guitar, organ, bass, drums), modal (dorian) inflections in the harmony and melody of the verse and a basic rock beat pattern." Unusually the chorus features timpani and the transition between verse and chorus creates a daring modulation from C minor (dorian) to G-flat major. "The musical style," writes Brackett, "skims aspects from contemporary rock songs, and is then produced and arranged from the vantage point of 'easy-listening' music." The song's harmonic progression resembles those of Beatles songs such as the G-flat/F/E-flat/D-flat descending bass line ("Bad to Me") and the vi-iii movement ("Please Please Me," "I Want to Hold Your Hand," "She Loves You," "And I Love Her," and others). The melodic turn on "true" of "if you find someone whose heart is true" resembles those in "Please Please Me" ("Last night I said these words to my girl") and "Do You Want to Know a Secret" ("nobody knows, just we two"). Although it has been his biggest commercial success as a songwriter, Al Kooper has reportedly stated many times that he was unhappy with the record. He originally hoped the song would be recorded by a group like The Drifters and based on the original demo of the song as recorded by Jimmy Radcliffe. Kooper would later re-visit the song, recording a funky version for his 1976 album Act Like Nothing's Wrong. Billy Fury recorded a cover which was included on the 1965 Decca album 14, also known as The Lord's Taverners Charity Album. ^ Brackett, David (1995/2000). Interpreting Popular Music, p.2-3. ISBN 0-520-22541-4. ^ Drabløs, Per Elias (3 March 2016). "The Quest for the Melodic Electric Bass: From Jamerson to Spenner". Routledge – via Google Books. ^ Kooper, Al (2008). Backstage Passes & Backstabbing Bastards: Memoirs of a Rock 'N' Roll Survivor (2nd ed.). Backbeat Books. p. 26. ISBN 0-8230-8257-1. 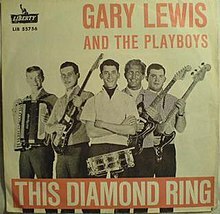 ^ "Gary Lewis and the Playboys Chart History (Hot 100)". Billboard. ^ "Various – 14". Discogs. Retrieved 2017-09-12. "Save Your Heart for Me"
"(You Don't Have To) Paint Me a Picture"
This page was last edited on 11 March 2019, at 22:00 (UTC).